Have you heard the news? Thinking has been banned. That, at least, is the assumption, or perhaps even the rule, that many people taking up meditation and mindfulness practices seem to believe. Thinking seems to have got itself a bad name. Thoughts are posited as the enemy. They keep us from the present, drive us up the wall and down the garden path, trigger our stress response and cause us to act and behave in wildly irrational ways. As Ajahn Amaro says in his interesting podcast on thinking; “thoughts are seen as some kind of infection — a nasty fungal growth between one’s ears.” They need to be stopped. We certainly can’t trust them. Instead, we’re instructed to return our attention immediately to the breath — whenever we notice that we’ve strayed into such dangerous territory. Even when we’re told that thoughts are not a problem we’re still offered strategies for dealing with them: label them, don’t judge them, be the observer, or witness (rather than getting caught up in them), ensure that you are calm and centered before trying to focus on them, and so on. Many meditation books and teachers seem to suggest that thoughts need to be avoided — that they are far too wily, slippery, and devilish to entertain. My Twitter feed on mindfulness is an almost continual ‘War on Thought’. It is good to admit to ourselves that thinking is a continuous, automatic and mostly beneficial function that we can only partly control. If we do so, we’ll see the wisdom of not trying to fight it. It is futile to try to shut it down, or switch it off, or blank it out as many people would like to do. It doesn’t help to be antagonistic towards a beast as powerful as the mind. You will never succeed in stopping yourself from thinking. You may think you have. But this just means you’ve lost awareness of your thoughts, or that your thinking is just gurgling about in the subterranean reaches of your mind, rather than in that little bit that you sometimes pay attention to. In other words, most of our thinking occurs unconsciously anyway. What we think of as our thoughts are merely the tip of the [brain’s] iceberg. Of course, any respite from the so-called tyranny of thought can be a pleasurable relief, and for this reason, the notion of emptying one’s mind is a seductive one. But let’s consider this a little further. Unconscious thoughts aside, it is the mind’s job to think; just as the eyes see and the ears hear. Now I doubt anyone would ever consider trying to stop themselves from seeing or hearing. We intuitively understand the futility of such an undertaking. Why then might we assume we could succeed with thoughts, where we’d fail with any other sense? And what would happen if you did stop thinking, for a few seconds, or a minute? You’d probably go: “Hmm, I’m not thinking!” or “Gee, my mind is very quiet at the moment.” Indeed, to recognize that your mind has gone quiet seems to require some sort of cognition. That leaves you in something of a bind. Better, I think, to let yourself think, rather than to struggle against the very nature of your mind. 2. Thinking well is more useful than not thinking at all. When we call someone ‘thoughtless’, it’s not a compliment! Neuroscience and psychology reveal not only that much of our thinking goes on unconsciously, but that most of it is seriously flawed. We’re riddled with all kinds of cognitive biases. 99 of them are listed in Rolf Dobelli’s little book The Art of Thinking Clearly. Few of us have been trained in thinking well, and while our default modes of thinking are usually adequate for daily living, they are also prone to serious and frequent error — which leads inevitably to erroneous decision-making. It takes time to think clearly and well. Our minds like making snap-decisions, but our lives may well go a little more smoothly if we resist these snap-decisions (and the actions that may follow from them) and spend some time mulling over the stuff our brain throws up and that we often assume to be true. Of course, if we immediately rush back to the breath each time we have a thought, we give ourselves no opportunity to engage in the kind of mulling-over — the reflective, empathic, nuanced and multi-dimensional thinking — that can emerge when we permit thinking to go on within a meditative space. For example, during meditation a particular thought might arise over and over again. Initially, it might come barging in, accompanied by a self-righteous tone or bristling with indignation. If you immediately dismiss it, it just gets buried (and will likely come back later with more force). Conversely, if you allow the thought some space — if you give it permission to continue without interruption — you’ll probably find that you become aware of connected thoughts and feelings which allow a more nuanced understanding of the issue to emerge. As a result of this process, you may find that when the thought arises subsequently your are able to notice it without reacting so strongly. Your relationship to that thought has changed. 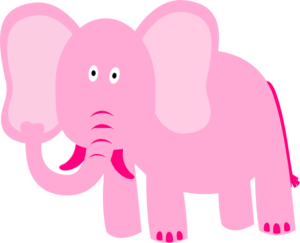 No doubt you’ve heard the thought experiment in which you are instructed as follows: “Don’t think of a pink elephant.” No doubt you also failed. Don’t think of me. I’m a pink elephant! When you tell someone not to think, or try following that ridiculous suggestion yourself, you’ll invariably end up thinking more. This is not just an assertion based on anecdotal evidence and personal experience. It’s the result of research conducted by Daniel Wegner (who is now a psychology professor at Harvard University) and described in Kelly McGonigal’s excellent book, The Willpower Instinct. What did Wegner discover? That trying not to think about something guarantees that it is never far from your mind. Not only that, but when you try to push a thought away, and it keeps coming back to your mind, you are more likely to assume that it must be true. Wegner calls this process ironic rebound. And can you guess what his solution to it is? Give up. That’s right: when you stop trying to control unwanted thoughts and emotions, they stop controlling you. His studies confirm that as soon as you give yourself permission to think a thought you were trying to suppress, the thought becomes less primed and less likely to intrude into conscious awareness. Paradoxically, permission to think a thought reduces the likelihood of thinking it. No one is quite sure what a thought is, but apparently they arise from the transmission of electrochemical signals in the brain. Although this sounds rather technical and abstract, it matches my experience quite well. I like to imagine that each of my thoughts is an electrical impulse, firing off somewhere inside my head — and some of them are of very low voltage (let’s say like a cheap, no-name brand battery), and some of them feel like 240,000 volt transmission stations. As such, some of them don’t last very long at all, and some of them feel like they’ll continue uninterrupted for 20 years. Others (most of them in fact) are so weak they don’t register in consciousness at all. Many meditators assume that if they don’t actively try to stop themselves form thinking, then the thoughts will just go on forever. This is a natural assumption to make. a) because many of us think more or less continuously, and b) because every thought we have seems to lead, or trigger, additional related thoughts and ideas. But these assumptions, I believe, are made on the basis of limited awareness. Most of us, of course, are not all that conscious of what is going on within our mind at any given moment — so we don’t notice those times when the mind is relatively calm, quiet or empty. In just the same way that we tend to notice objects rather than spaces in the world around us, we tend to notice thoughts rather than the gaps between them. However, when we sit and pay attention to our thoughts we develop a clearer idea of what is really going on within our minds. We see that thoughts might have a beginning and an end; that some are fast moving and others relatively slow. That some come accompanied with a strong emotional charge (or voltage) and others with nary a spark. We might also discover that thoughts nearly always run out of juice — and that there are many moments of quiet, even in a seemingly frantic mind. Don’t believe me? Then try this exercise. Sit for 20 minutes and think continuously. Don’t let yourself stop thinking for an instant. And each time you get distracted by the breath, or the body, or a sound — bring your attention immediately back to your thoughts. And if you can’t find a thought? Make one up! If your meditation is a continual effort to stop, change or banish thoughts, then essentially, you’ll be engaged in a war against yourself. A thought arises and you say “Go away! You’re not welcome here.” Or “Only positive, loving thoughts allowed.” How would you respond if you went to speak to someone and they responded in such a manner? How do your own thoughts respond? And how can you win such a war? Many people are drawn to meditation because they’ve recognized, on some level, that thoughts contribute to or exacerbate stress, anxiety, depression and so on. And because stress is uncomfortable your tendency might be to try and push it away, along with the thoughts and feelings that accompany it. In other words, you may have spent most of your life trying to banish unwanted thoughts. It’s a deeply ingrained habit. But has this strategy ever worked? Do thoughts (or feelings) go away just because you tell them to? Unfortunately, many meditation instructions recommend this same strategy. You’ve probably heard this one: whenever you notice that you have drifted into thought, gently bring your attention back to the breath. This type of instruction may just be reinforcing the avoidant and dissociative tendencies that many of us employ habitually (and further demonizing thoughts and the thinking process). What, you might ask, is gentle (or helpful), about dismissing or ignoring your thoughts? For example, how would you feel if you and I were sitting opposite one another at a table, new friends getting to know one another. And every time you opened your mouth to speak I’d look away. No doubt you’d be offended or annoyed. You may like to check to see whether this dismissive attitude is the one you adopt when you “bring your attention back to the breath”? He also says that he was initially pleasantly surprised — and pleased — with the results. To notice that the mind can be quiet, even if only for a moment or two, can certainly be a relief. Over time however, he came to realize that a mind without thought is not necessarily peaceful, nor free of suffering. It’s just a mind without thought. Most newcomers to meditation seem to assume that no thoughts = peace of mind. But this equation does not hold true. In fact, the effort to keep the mind quiet almost guarantees a certain restlessness. Why? Because keeping thoughts at bay requires that you’re always on the defensive; alert to intruders. You have to be on guard 24/7, like a sentry or watchman. This continual vigilance will probably wear you down. On the other hand, if you’re willing to invite your thoughts in, and to treat them like guests rather than enemies, you’ll find they probably behave more like friends than foes. I’ve certainly found that the degree of peace I find within meditation is directly proportional to the degree to which I am willing to entertain those thoughts and feelings that I might otherwise choose to suppress or ignore. When I allow myself the time to mull over, process and integrate them I find that peaceful states of mind arise quite naturally, effortlessly and spontaneously. On the other hand, when I force my mind to be quiet, the resultant sense of peace seems relatively fragile and brittle. We can’t meditate all day every day. Even if we have the intention to remain mindful 24/7, we’ll still spend most of our time on automatic pilot. I’m not saying this is bad, I’m just pointing out that that’s the way things are. Now given that we might spend 20 minutes a day in formal meditation practice, that leaves 1440 minutes when we’re not. 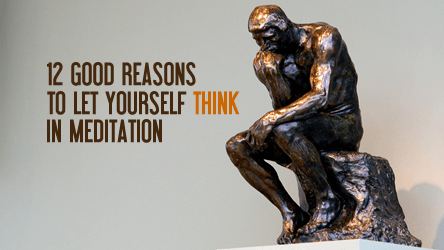 It would seem to me that how we relate to our thoughts in that non-meditating time, then, would be at least as important as how we relate to our thoughts during meditation. That being the case, we’ll need a meditation practice that helps us to relate skillfully to our thoughts outside of meditation. Attempts to suppress thinking may lead to some degree of calm in the short term. But what happens over time? Are you learning how to deal better with the thoughts that will inevitably occupy your attention in those 1440 minutes a day when you are not meditating? Will you be developing more sophisticated and helpful skills or internal resources? Will you feel more or less willing to tolerate your thoughts outside meditation. Will you feel more or less able to engage with them competently? What kind of attitude might allow you to develop the kind of skills that allow you to engage effectively with thoughts? 8. By not allowing thoughts you limit your understanding. On almost every day you’ll be exposed to situations that trigger some degree of fear, anger, hatred, confusion, shame, jealousy, panic, sadness, apathy, guilt, and depression — along with moments of happiness, joy, and contentment. During meditation, because you’re out of “harm’s way”, so-to-speak, such feelings will recede somewhat so that you can calm down and review the situations that triggered these emotions. If you try to banish all thoughts — including those that relate to the emotions you experienced throughout your day — you won’t be able to engage in such a review. This is extremely unwise, because this cooldown period helps to restore the body and mind, and gives us the opportunity to scrutinize and renegotiate our emergencies and traumas in many different ways (while they are still fresh in our minds). If you stop this process, you prevent the natural healing functions of your psyche from working as they should. Finally. Success! After 30 years of diligent meditation you can sit for 20 minutes and remain focused on the breath. Yay! You are now the proud owner of unwavering focus. What an excellent achievement. You are now supremely qualified for the tasks of watching paint dry and grass grow. On the other hand, in the pursuit of this ideal you seem to have stymied your creative thinking. The great ideas that used to distract you when you began meditating have all dried up — and those funny little a-ha moments that would surprise you from time to time are no longer game to raise their little heads. Did you throw the baby out with the bath-water? Being able to calm yourself down, when necessary, is a useful skill. Being calm all the time is not. Gaining some degree of insight into your thoughts and emotions is much more useful than trying to expel them from consciousness. The former approach is healthy, the latter is not. It would seem obvious that thoughts come in all kinds. Positive and negative. Helpful and troubling. Worrisome and confident. Inspiring and discouraging. Compelling and questionable. As such, some of them might be useful allies. They might generate ideas or issue reminders that help us to find balance, see from new perspectives and sort through what prevents us from relaxing. Others might generate anxiety, looping patterns of worry or a slide into dark and dismal territory. These are important distinctions to make — and they can only be made if you actually take the time to listen. You need to ‘lend an ear’ to your own thoughts and give them time to tell their stories. What initially might seem troublesome might resolve into an important insight if it’s given time to unfold. And despite all the rhetoric to the contrary, some thoughts may actually lead you into calm states of mind. For instance, if you find a particular idea or train of thought interesting, that can actually initiate quite deep focus. From this, deeper and more refined states of awareness may unfold — leading eventually into realms beyond thought. Thoughts are not good or bad. They have no intrinsic meaning. They are just words, sounds or images passing through the mind. It’s our interpretation of our thoughts that gives them meaning and may cause us to feel anxious, troubled or delighted depending on that interpretation. Thoughts arise for a reason. They are not your enemy. They are not the antagonist in the war you may wage inside yourself. Indeed the aren’t even one of the combatants. 12. You’ll think during meditation anyway. Here’s my bet. If you sit down to meditate with the intention of stopping all thought there’s one sure outcome: failure. Even if your goals are a little less lofty — perhaps just to slow the mind down, or gain some clarity — success may still remain elusive. Instead of fighting with this simple reality, give in. Let yourself fail. Instead of seeking perfection, seek mediocrity. Be a lazy (but relaxed) meditator, and learn to tolerate, be with and learn from your thoughts instead of trying to banish them from consciousness. You’ll save a lot of effort and energy by not fighting with them. And don’t take that instruction to bring your attention back to the breath quite so seriously, after all, if you follow that particular injunction you’ll have to spend time thinking, because how can you bring your attention back to the breath if you don’t? For some alternative perspectives on this topic refer to Shinzen Young’s Meditation and Emptying the Mind , or the New York Times article, No Time to Think. that a thought with no attachment, is a thought without a mate. PS: it resonates with me! It’s hard to miss the message here: when thoughts go on in meditation, you’re not a bad meditator, you’re a normal human being. There’s that encouraging thought and many more. I particular respond to the sensible assertion that “You can’t make peace through war.” How much more sensible to allow thinking and learn from it, than to waste time opposing it. I love this! Now I can take away the ‘assumption’ then that meditation is ‘another thing to do’ especially when you are trying so hard to either ‘clear your mind’ or ‘redirect your thoughts’. Fantastic article, for many years I have struggle with the same thing in my practice. I have followed a well worn cycle where my practice changes from going well, to tension, to frustration and ending with me taking a break from effort and just sitting and encouraging thought. While during these “breaks” my mind is clearer and more peacefull I inevitably start to feel that I am only encouraging a wandering mind and start the cycle all over again. Thanks for taking the time to comment. I’m glad to hear that you found the article useful. There are many people, like you, who find that their minds are calmer and their thinking clearer when they actually attend to — rather than suppress — thoughts. Thanks for this Matt, I feel it’s quite liberating, it takes much less effort and quite an amazing process to be able to delve into thinking and to give it 100% attention. It’s as if a part of you says ‘yey your listening at last!’ and ‘Welcome home, I’ve been waiting for you’ there’s always an open door and you can walk right in. Your reply moved me. I’ve been struggling with insecure thoughts my whole damn life. It’s time to let them be and accept them. Than I can take steps to change my actions that will create more positive thoughts. But you saying “yey you’re listening at last” comforted and touched me. And my thanks to Matthew for completely changing the way I look at mindfulness now. That’s great to hear Leon. Thanks for your comment. Thanks Matt, that was very insightful. I think this will help me a lot and therefore the students I hopefully guide one day :). I’m very pleased to hear that David. Perhaps you could go one step further and pat yourself on the back every time your mind drifts? Or maybe you could even encourage it to drift, though that might seem a little risqué! I love that you support offerings for each of us to explore for ourselves Matt….and for our own experience to be our guide. This article is so useful, brilliant, embracing and healthy. Thank you for being so bold as to discover the path that feels so intrinsic to you and sharing it with us all. We are blessed! Thanks for your kind words Chelsea. May you continue to enjoy a delicious confusion! “Let the mind think …but don’t be swept away ..” My favourite meditation instruction. Great article. Thanks. Thanks for your comment Shakti. I’m actually suggesting that it’s okay to swept away too; afterall, we’re bound to be swept away in our thoughts from time to time, so there’s no use pretending otherwise! Furthermore, you may have noticed that your mind does its best processing, and comes up with its most creative ideas, when you’re not trying to control it at all. Excellent analysis, this article is solely meditation in a nutshell (condensed version). Great work and I look forward to reading many more. Thanks Nicholas. I’m glad you enjoyed the article.